At Rainbow International, we’re passionate not only about hurricane recovery but about preparedness. Preparing your home or business for a hurricane can help minimize structural damage and keep you and your loved ones safe. 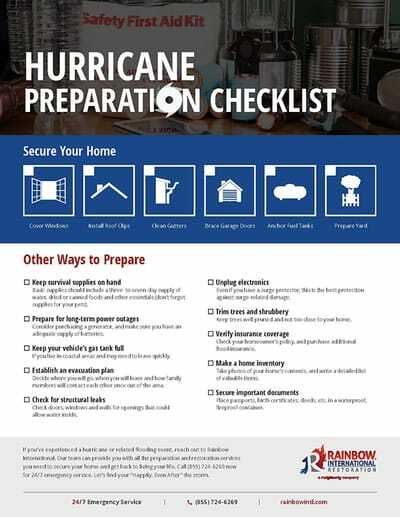 Download our Hurricane Checklist to prepare your home or business for hurricane season. Call (855) 724-6269 now for 24/7 emergency service. Keep survival supplies on hand: Having the right supplies during an emergency is vital. Basic supplies should include a three- to seven-day supply of water, dried or canned foods and other essentials for everyone in your home (including pets). For a thorough list of supplies, consult FEMA’s emergency supply list. Prepare for long-term power outages: Consider purchasing a generator, and make sure you have an adequate supply of batteries. Even a small generator used to run a refrigerator, sump pump or well pump could make life easier during or immediately following a hurricane. Keep your vehicle’s gas tank full if you live in coastal areas and may need to leave quickly. 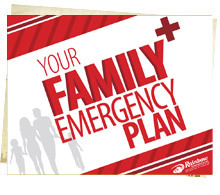 Establish an evacuation plan: Decide where you will go, when you will leave and how family members will contact each other once out of the area. Check for structural leaks: Check doors, windows and walls (such as areas where cables and pipes enter) for openings that could allow water to penetrate. Unplug electronics – even if you have a surge protector: This is the best protection against surge-related damage. Keep your phone and a fully charged, portable phone charger on hand for emergency communication. Trim trees and shrubbery: Keep trees well pruned and not too close to your home, to allow wind to pass through with minimal damage to your home, your vehicle and the trees themselves. Verify insurance coverage: Check your homeowner’s policy, and purchase additional flood insurance through the National Flood Insurance Program to ensure you have adequate flood protection. Make a home inventory: Take photos of your home’s contents, and write a detailed list of valuable items. Secure important documents (passports, birth certificates, deeds, etc.) in a waterproof, fireproof container. Use window shutters (not the pretty ones – the ones that protect your glass) to keep debris from breaking windows. Use roof clips to hold your roof on and prevent building materials from becoming airborne debris. Your roof is not too heavy to fly away. Clear your gutters to minimize rain damage. Use garage door braces to keep your garage door from blowing away. Prepare the yard: Put clutter, outdoor furniture, potted plants and trashcans in a garage or shed. If you need help securing your home, check out our board-up and tarp-over services. Don’t wait until a hurricane watch has been issued. Prepare your home and family for a storm today. If you’ve experienced a hurricane or related flooding event, reach out to Rainbow International. Our team can provide you with all the preparation and restoration services you need to secure your home and get back to living your life. Call (855) 724-6269 now for 24/7 emergency service. Let’s find your “Happily. Even After” the storm.